"Sydney has always felt invisible. She's grown accustomed to her brother, Peyton, being the focus of the family’s attention and, lately, concern. Peyton is handsome and charismatic, but seems bent on self-destruction. 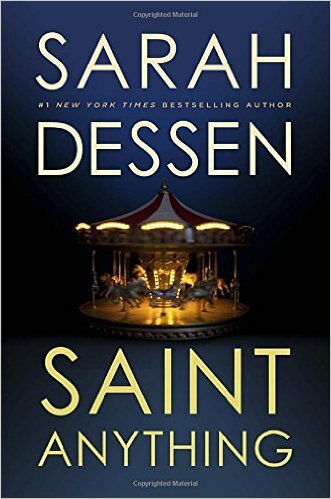 Now, after a drunk-driving accident that crippled a boy, Peyton’s serving some serious jail time, and Sydney is on her own, questioning her place in the family and the world. 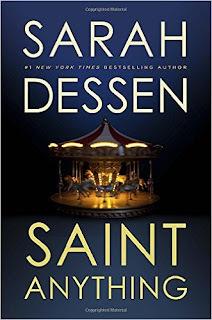 Saint Anything is Sarah Dessen’s deepest and most psychologically probing novel yet, telling an engrossing story of a girl discovering friendship, love, and herself. " When I found this book at my local library, I jumped at the chance to check it out. I had been wanting to read it for quite a while. The cover is simply beautiful & to be honest- I totally judge a book by it's cover... often. It took me a little while to get into the book but I chalk it up to the fact that I was suffering from a total book hangover from the last book I had finished. After buckling down & pushing forward, I fell head over heels for everything about the book. It went from just being words that I was reading to characters that I was invested in 110%. There are so many different elements to this story. Most that I loved. A couple that just made me cringe a bit. Many that took me back to experiences from my own teenage years. I believe there are parts of this story for everyone.